With a clear understanding of what biodiversity is and the importance of it, it was time to explore the biodiversity in their very backyards. Each forest has its own composition of species that play different roles in the ecosystem. Thus every ecosystem is unique and this was the message we wished to share with our students. 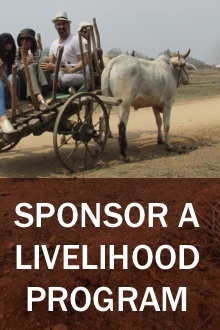 IT was now time to discover the wonders of the forest of Pench. The students ready to watch videos on the forests. 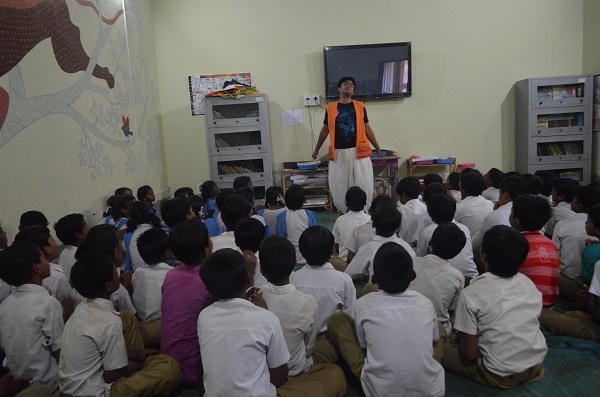 Beginning with a video on the Pench Tiger Reserve and a second, on tropical forests, the students were encouraged to observe the animals and plants in both the videos. The students made a note of the differences between both the forests. 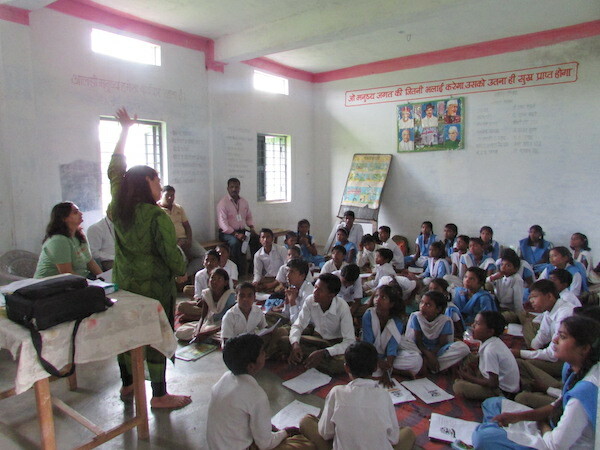 They then brainstormed on the possible reasons for a difference in the biodiversity of a tropical forest and their very own forest of Pench. 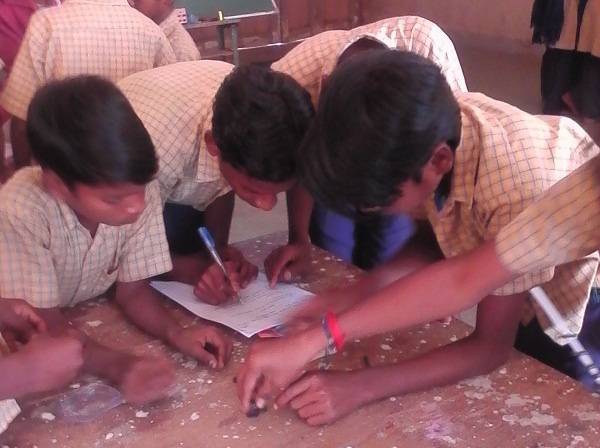 Right in time, prior to their Board exams, Vidnyan Vahini conducted a workshop for our 10 and 12th grade students. 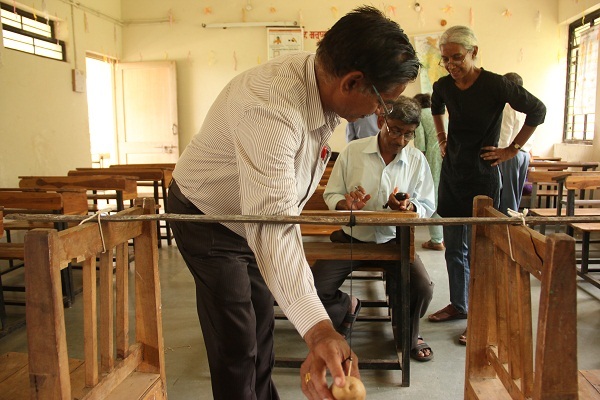 To simplify the various laws of Physics and reactions in Chemistry, Mr. Sharad Godse and Mrs. Urmila Parchure joined us in Pench for a hands- on workshop. Often, challenging subjects such as Physics and Chemistry are not taught in a hands- on fashion, leaving in the minds of students many a doubt. Mr. Godse and Mrs. Parchure focused on these problem areas and theories ahead of their Board exams to ensure our students score the highest possible marks in March. Beginning with basics such as what acids and bases are to the periodic table, our students studied it all. For the day, classrooms were converted into chemistry labs with various colourful liquids to noisy puffs of smoke. Students checking the Ph levels of substances. After our students got an introduction to our unique and life- giving atmosphere, it was time to dwell deeper. Mr. Sharad Godse and Mr. Vinakay Dixit of Vidnayan Vahini came down to Pench to give the students more insight into the atmosphere and the properties of air. 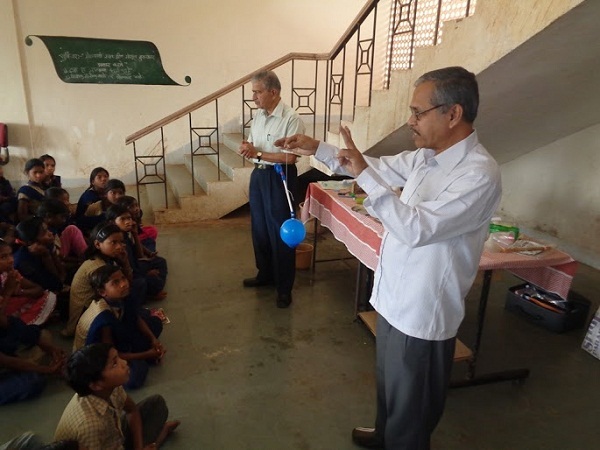 Mr. Godse and Mr. Dixit introducing the various properties of air through experiments. Who hasn’t ever tried to make the two similar ends of magnet touch? Or, tested how many paper clips he or she can lift with just one magnet. Magnetism is perhaps one of the most entertaining parts of Pyhsics and this month, the students had a wonderful workshop by Vidnyan Vahini on it. Mr. Sharad Godse and Mr. Vinayak Dixit of Vidnyan Vahini were down in Pench to epxore with the students the properties of magnetism and why it is so unique, and the importance of the phenomenon in our daily life. Students understanding the principles of magnetism. This month, we had a unique workshop by a very unique personality, Vikram Sridhar. Vikram is a Performance storyteller and theatre practitioner who uses his art and story telling gift to make a difference. Vikram believes the body is a tool of communication. Through his workshops he assists students in becoming more aware of their own bodies and helping them use them as communication tools like he does with his folktale telling performances. Vikram animated as ever! The students were simply fascinated by his energy and comic movements. Our planet as it once began has been constantly undergoing changes. The only difference between the changes taking place in the last few centuries and those before that is that now these changes are instigated by man’s actions. The students know one thing like a gospel truth: life cannot exist without oxygen. It was time to however introduce them to other atmospheric gases playing equally significant roles in the upkeep of our planet. Students understanding the task at hand. The atmosphere consists of 78 per cent nitrogen, 21 per cent oxygen and 1 per cent of all other gases and water vapour. The students were meant to correctly label the pie chart. 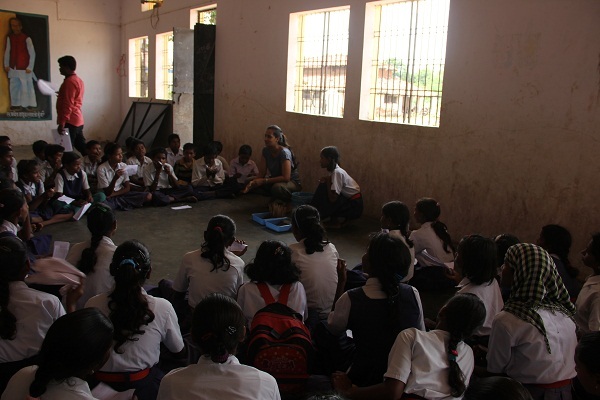 The last week of September saw the students of Pench, Maharashtra getting up close and personal with water. They got right into its chemical composition to its behaviour. 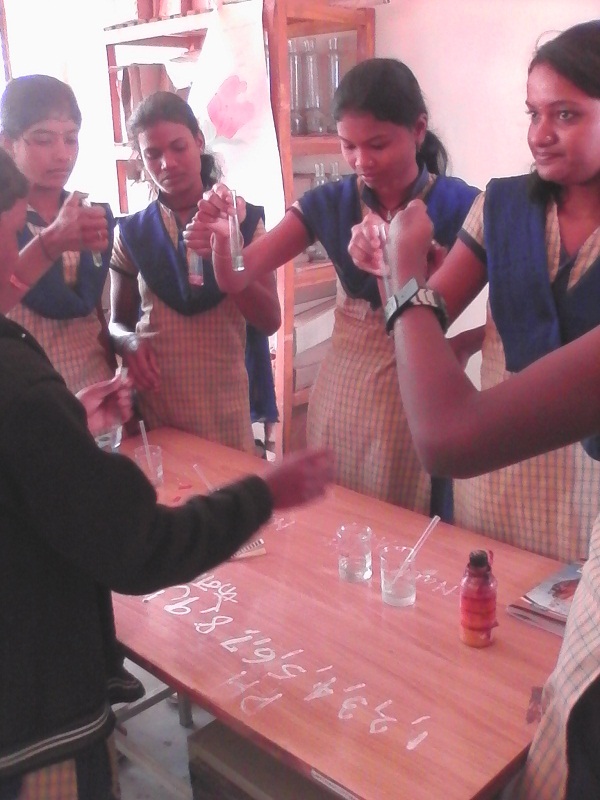 With a quick introduction to the chemistry and physics of water, the students studied the water cycle that makes water just so unique. 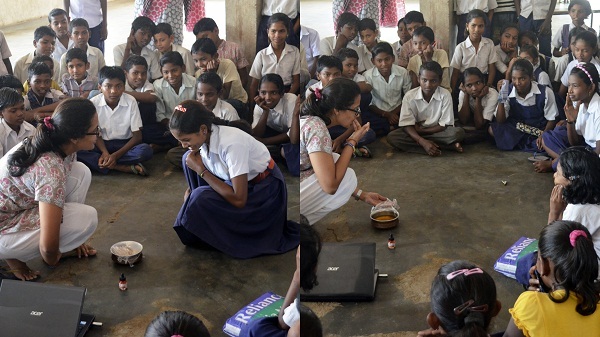 We had a little fun challenging some of the students to try water that had condensed from the use of dirty, inky water (Yes, like we are sure you have guessed, there were no volunteers, it was down to Pooja to drink it). 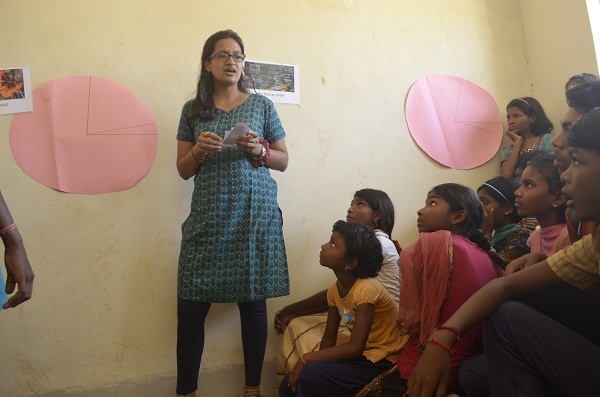 To introduce students in schools at the Karmajhiri side of the Pench Tiger reserve to simple scientific concepts, professors from the Tata Institute of Fundamental Research (TIFR) conducted a hand- on entertaining workshop. Mr .Surendra Kulkarni of TIFR has been our partner since the last two years. IT is thanks to him, we have been able to bring to these children such a wonderful session on the wonders of science. Trees come in different shapes and sizes. They are those that may be planted by our city managements or those that stubbornly firmly planted themselves in favourable nooks. They sway above us and temporarily offer us shade on a hot summer’s day. Their flowers and fruits colour our streets red and blue in spring. And, in monsoon, you give a million thanks to it when you forget your umbrella and need to take cover under the giant canopy it so beautifully provides. Learning about the value of our forests. Education in short staffed government schools is riddled by a string of problems, the most important being the lack of use of engaging methods in class. Understanding the functioning of a pendulum using just kitchen items like potatoes, tomatoes and onions!